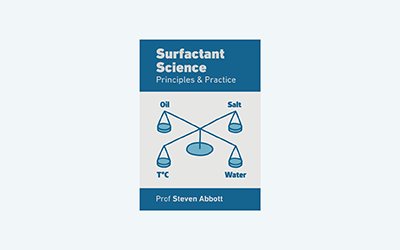 I had resisted adding a page like this because I thought that "everyone" knew about the different types of surfactant. But it has turned out to be popular! Another classification, more contentious, is "green" v "non-green" as discussed later. Although the alkyl groups are typically shown as, say, C12, they are usually (for cost reasons) mixtures and there are significant differences between linear and branched alkanes, with the branched alkanes often more resistant to the formation of inconvenient liquid crystalline phases as they don't pack so well. The Ethoxylates are long alkyl chains with varying numbers of ethylene oxide groups, conventionally shown a CxEy or CxEOy. In Europe there is concern that ethoxylates are "bad" because they theoretically might contain minute amounts of 1,4-dioxane which sounds scarily like dioxin to which it bears no relationship. The alkyl-phenyl ethoxylates have, for various reasons, excellent solubilising power (high ξ values). Unfortunately they also tend to be endocrine disrupters and have been phased out - with many problems in finding adequate substitutes. Biosurfactants are often complex sugar-substituted systems such as sophorolipids, rhamnolipids, trehaloselipids... - though these often have carboxylate side-chains so can behave somewhat like ionics. Alkyl phosphates used to be hugely popular because they are wonderfully effective detergents but their influence on eutrophication of streams and lakes caused a big reduction in phosphate detergent use. Phospholipids are natural surfactants. Whether they are "good" because they are natural or "bad" because they contain phosphate is an interesting debate. Classic soaps - salts of long-chain fatty acids such as sodium stearate. Although they are "natural" they are often rather caustic (high pH) and prone to formation of scum, so aren't too popular. It is amusing to see cleaning products "guaranteed soap free" even though they are the most ancient of surfactants and can, in principle, be fully "green". Bio-based salts such as sodium stearoyl lactylate (i.e. the monostearic ester of sodium lactate) or the "sulfate free" (because it's a sulfonate) sodium lauroyl methyl isethionate, or the amino-acid derivatives such as sodium lauroyl sarcosinate. The significance of "sulfate free" is that in the US the current panic is over sulfate surfactants which are "bad" because one of them, SLS, is known to be a skin irritant in high concentrations when left on the skin for a long time (not a relevant consideration in a shower). The trimethylammonium alkyl halides are the archetypal cationics, with CTAB, cetyl trimethylammonium bromide, as the most common. Benzalkonium chloride and similar molecules such as the pyridinium chlorides aren't great surfactants but are very useful antimicrobials. Indeed, the "onium" surfactants all tend to be antimicrobial because they readily interact with the anionic head of phospholipids in cells. This also means that the "onium" surfactants can be highly irritating to human skin. The sultains contain a quaternary ammonium and a sulfonate group. Lecithin typically contains the choline group (positive quaternary) linked to a phosphate (negative). One excellent definition of "green" is something that uses precious resources with high efficiency. By that standard, surfactants such as SLES made in vast quantities via carefully optimised petrochemical routes will be super-green. An alternative definition is an entirely natural surfactant such as a sophorolipid or a rhamnolipid. Because the rhamnolipids are derived from highly toxic pseudomonas bacteria, and because fermentation and extraction of these surfactants is massively resource intensive, it could be argued that these currently are anything but green. Some prefer conventional (highly effective) surfactants made from entirely renewable sources by "nice" processes that aren't "chemical" (though a classic chemical step, ester hydrolysis with strong, hot caustic soda is seen as not being "chemical"), even though the factories and the processes look entirely chemical to an outsider. Whether the orangutans displaced by palm oil plantations would prefer C12 chains to be produced from oil is an interesting question. Note that the nice and friendly "cocoyl" (as opposed to the "palmitoyl") prefix merely means "typical C12 fatty acids" which can come from palm kernel not just from coconuts. However, the orangutans might be happy as the plantations are arguably there for the palm oil and the extraction of the oil from the palm kernels for surfactants isn't an extra burden on them. One interesting move is to derive the key components of surfactants from low-value parts of the agricultural process. Farmers aren't stupid and actually very little that they produce is "waste" - they can usually find someone who will buy, say, the "waste" from olive oil production. However, many of these outlets are very low price. If, say, sugar for APG-style surfactants or as food for growing biosurfactants can be made from straw then arguably it's a win-win for everyone; though even here there is a problem of scale: trucking large amounts of straw to a large-volume converter might turn out to be less green than more conventional approaches. It all needs careful thought. It's worth noting that driving a few miles/kilometres to purchase a cosmetic based on the most carefully chosen natural resources, or even producing these products in small, inefficient batches might well result in a negative carbon footprint and an overall depletion of non-renewable resources. Life-cycle analysis of many "renewable" products often make embarrassing reading. Finally, to be really green, just use much less shampoos, bubble baths, dishwashing liquid, laundry detergent. This will distress the surfactant suppliers but will have no downsides for the consumer as most of us use unnecessarily large amounts for no cleaning benefit.